Xiaomi is all set to release the Xiaomi Mi Pad 4 on upcoming Monday, June 25. Though Xiaomi has revealed not much as of now, still we have gathered a lot of info about the Mi Pad 4 via leaks from various trusted sources. Most of the Xiaomi Mi Pad fans are curious to know what exactly has changed in the Mi Pad 4 over the Mi Pad 3. So here we are to help you out with the detailed specs comparison of the Xiaomi Mi Pad 4 Vs Mi Pad 3. Back In April 2011, when Mi Pad 3 was launched, it comes with the same design as Mi Pad 2. But this time, we are expecting a slimmer version of the Mi Pad. Moreover, the Mi Pad 4 will come with face recognition technology that will unlock the phone by scanning user face via the front camera. It is not clear whether there will be an infrared camera that will help in carrying out face unlock in low light. But we all will get to know soon. There won’t be any fingerprint scanner on the Mi Pad 4. But we don’t have one on the Mi pad 3 either. But with face unlock technology Mi Pad 4 is undoubtedly a better one here. It is claimed that Mi pad 4 will be powered by Snapdragon 660 SoC which is the best SoCs for the mid-range smartphones to date. There might be two versions of the Mi Pad 4, one with 4 GB of RAM with 64 GB internal and another one with 6 GB RAM with 128 Gb inbuilt storage. You won’t see card slot on both the variants. Whereas, the Mi Pad 3 is powered by MediaTek MT8176 2.1 GHz hexa-core processor coupled with PowerVR GX6250. Mi Pad 3 packs 4 GB of RAM and 64 GB inbuilt storage. Also, Mi Pad 3 does not have a card slot like its successor. With regards to the processor and RAM, the Mi Pad 4 is worth upgrading if you do heavy multitasking and gaming on your tablet. Moving to the camera, the Mi Pad 3 comes with a 13 MP, f/2.2 aperture camera on the rear side and a 5 MP f/2.0 camera on the front. The camera on the Mi Pad 3 was not that great, but it was useful in the tablet category of its range. As per the camera configuration files which are leaked online, the Mi Pad 3 successor, the Mi Pad 4 might pack a 13-megapixel OmniVision OV13855 sensor with f/2.0 aperture on the rear side and a 5 MP Samsung S5K5E8 sensor with f/2.0 aperture on the front. Now, these are just camera specs. How good is the camera? We can tell you this once we get our hands on the tablet. Both the tablets have 8 inches full HD display this time the form factor of the screen might be different. The Mi Pad 3 features a 7.9 inches display with 1536 x 2048 pixels and 4:3 aspect ratio. As per leaks, Mi Pad 4 will also have a full HD display with a better PPI density and 16:10 aspect ratio. The bezels on the Mi Pad 4 will also be thinner which will make it more compact as compared to the Mi Pad 3. 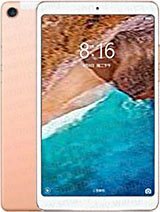 Mi Pad 3 comes out of the box with Android Marshmallow 6.0 which feels outdated in 2018, while the Mi Pad 4 will run on Android Oreo 8.1 out of the box. It is also rumored that Mi Pad 4 could be the first Xiaomi devices to get to taste the MIUI 10. 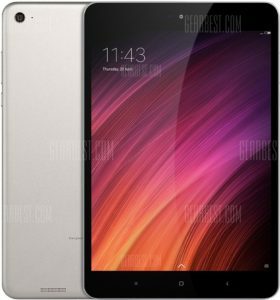 The Xiaomi Mi Pad 3 packs a 6600 mAh battery while the Mi Pad 4 might pack a 6000 mAh battery. Despite the bigger battery on the Mi Pad 3, both tablets will give you almost same battery life. That’s because the SD 660 is not only robust but more power efficient too over the MediaTek MT8176. But one more thing that is in favor of Mi Pad 4 is it might get a Type-C connector for fast charging and data transfer. The Mi Pad 3 weighs 328 grams which is thin as compared to other 8 inch tablets. And the Mi Pad 4 is going to be even lighter. The “Mi Pad 3” does not have any cellular connectivity. You get only WiFi and Bluetooth 4.1 and sadly no GPS. But you will get the option of LTE GSM connectivity with 6 GB RAM variant ( top model ) of the Mi Pad 4, while the 4 GB RAM variant will get only WiFi and Bluetooth 4.2. Moreover, Mi Pad 4 also receives an A-GPS and FM Radio. What’ about the price? In recent leaks, the base variant of the Mi Pad 4 will be launched around the same price as the Mi Pad 3. The Mi Pad 4 base variant with 4 GB RAM will be priced at CNY 1,499 (roughly Rs. 15,600). While the LTE connectivity model with 6 GB RAM will be priced at CNY 1,999 (roughly Rs. 20,800). Which one is better for you? As you might expect, the Mi Pad 4 is far better than the Mi Pad 3. There is no reason to stick with the Mi Pad 3 unless or until you are very much obsessed with the Mi Pad 3. 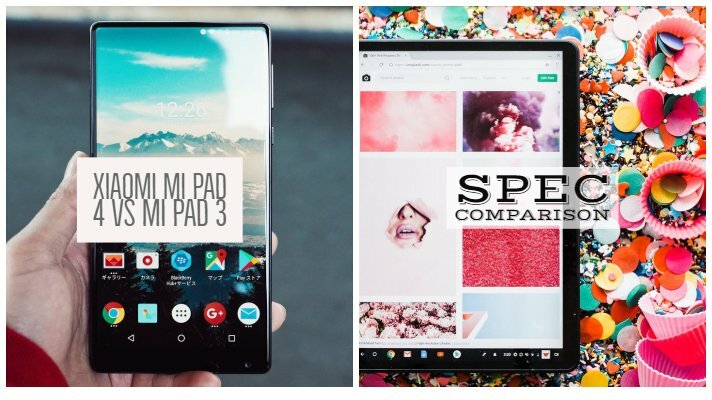 That’ all about the Mi Pad 4 and the differences between the Mi Pad 4 and its predecessor Mi Pad 3.